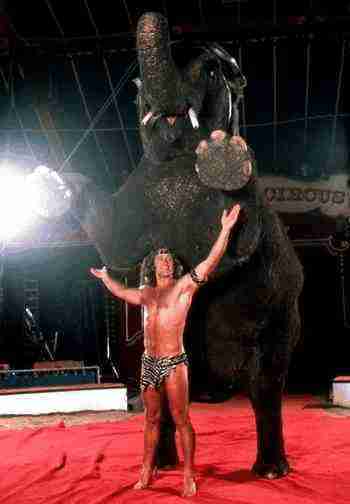 Ben Williams, who, clad only in his trademark tiger-skin loincloth, seized the attention of Big Top crowds by fearlessly and flamboyantly cavorting under, above and around elephants to become one of the top circus attractions of recent decades. . The cause of Mr. Williams's death was gastrointestinal cancer, said his stepfather, Bill (Buckles) Woodcock, himself a famed elephant presenter. 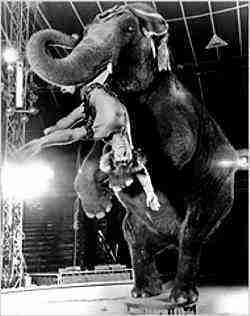 Mr. Williams's mother, Barbara Woodcock, was a member of the fourth generation of her family to perform with animals in circuses. 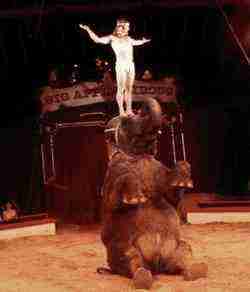 Ben's father, Rex Williams, was an elephant trainer known for slipping camels and horses into the act. After Barbara and Rex divorced, she married famed elephant presenter Buckles Woodcock, whose own father was a legendary elephant showman, with family roots going back to the Orton's Badger Circus, which started in Wisconsin in 1854. Can it be any wonder that Ben Williams took to elephants the way most children warm up to cocker spaniels? At the age of 6, he was already a PREVIOUS part of the family act. "He could climb around the elephants almost like he was a chimpanzee," Mr. Woodcock said in an interview on Tuesday. And, truth to tell, Ben Williams — with his tiger-skin loincloth, million-watt smile and streaming blond mane — rivaled Anna May in popularity, if not poundage. The human would cavort under, over and around Anna May and other pachyderms, not to mention a leopard walk-on. He would lie motionless as Anna May came within inches of crushing him. He would grin as the elephant grabbed his leg in her mouth and spun him horizontally. He did a handstand on Anna's head. Mr. Williams selflessly gave credit to his costar, a native of Burma whom his stepfather's father bought from another circus at the age of 5 in 1951. She was named after Anna May Wong, the silent movie star. "She makes me look good," Mr. Williams said in an interview with New York magazine in 1985. "She's forgotten more tricks than I know." 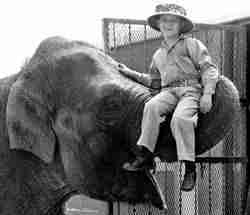 Ben Harold Williams was born On Jan. 18, 1953, in Fort Worth, Tex., and first rode an elephant at 4 months. As a toddler, he made a jungle gym out of the species, intrepidly leaping from back to back. He was soon cutting the elephants' very large toenails, among other grooming chores. When not on the road, he went to school in Ruskin, Fla., where he was president of the National Honor Society. He turned down a scholarship to the University of South Florida to stay with the elephants. Ben, his mother, stepfather and two siblings performed together in a small circus started by his mother's parents. They worked with the Ringling Brothers and Barnum & Bailey Circus in the 1970s and the Big Apple Circus in the 1980s and 1990s. Anna May, a stunningly intelligent beast, liked most people but fell hard for young Ben. 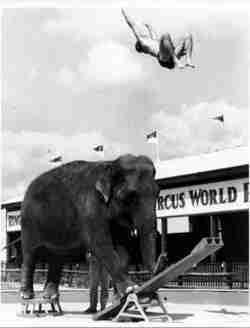 She liked to hoist him high in the air with her trunk. By the 1970s, they were a hit act. "She raised him, really," Mr. Williams's mother said in an interview on Wednesday. 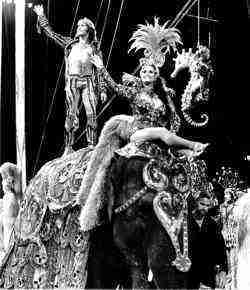 Around 2000, the Big Apple Circus stopped including elephant acts, partly in response to animal rights groups' protests. Mr. Williams's family gave Anna May and their other pachyderms to a refuge in Arkansas. She is buried beneath rocks meant to represent a heart-shaped circus ring. Ben liked to visit. Mr. Williams was offered opportunities to pursue other lines of work, New York magazine reported. But he always refused. "I just went back to running around in the loincloth and jumping around with the elephant," he said. "It's what I do best." Note: Ben died of gastrointestinal cancer in 2009, he was 56.